Graduation is the perfect excuse for a celebration. For weeks, graduates and parents alike plan and attend a whole host of fun parties. 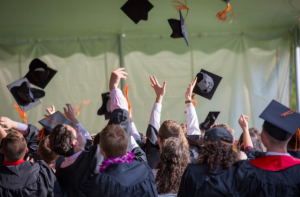 Whether graduation is still a little while off for you, or just around the corner, it’s never too soon to plan a celebration with friends and Silk Road Transportation. Here are some of our top ways to celebrate if you’re looking for inspiration. Chances are you’ve put off vacationing to finish your study commitments. Now that it’s all out the way, it’s time to let your hair down and do what you want. So, why not grab a group of friends and head over to Santa Barbara for some seriously fun ways to let loose. In fact, there’s no better way to celebrate the end of a very important chapter than taking a trip with your besties. Don’t worry about getting around, we offer professional and reliable Amtrak and private airport transportation. Get together your friends and family for a meal worthy of a celebration. Santa Barbara is filled to the brim with incredible dining experiences, so you’re sure to find something to suit everyone’s taste buds. No doubt, you’ll want to keep the bubbly flowing and the night going without having to worry about getting to the after party. Book a party bus to get you and your crew to the restaurant and then anywhere else you fancy going after dinner. If clubbing and partying it up isn’t quite your style, or perhaps you just fancy unwinding after such a hectic period of studying, consider booking a day trip to the gorgeous Santa Ynez Valley and surrounds to experience the beautiful backdrops and super-chilled activities. Part of your relaxation means not having to stress about getting around. We’ve got you covered. Treat yourself to a black car service, or go the whole hog and hire a limousine for the day and simply sit back, relax, and let your stresses finally drift away. Well done, graduate, you deserve some celebration time! Book your celebration transport today with Silk Road Transportation.